Exam grades were just posted for Pharmacology. I got 100% on the final. Holy cow! They weren't supposed to come until Thursday, but lookee what the mailman brought! Finished my two pharmacology finals yesterday. Glad to be free of the class! I was one of the only As (if not the only A) going into it. I think I did alright. In my core nursing classes like this one, 77.9 and below is an F. And for just the exams, you have to have at least a 78% average to move forward with the program regardless of your overall grade for the class. Fail a class twice and you are kicked out of the program. So there was no worries of that for me. I only needed a 16% on the final to make the 78% threshold. But I want my A. I want to keep my 4.0 average as long as I can. I'm pretty sure I did. The class was tough. Some weeks we had 9 or more chapters to cover. Not difficult, really, just a lot of information. It was also the first class where you couldn't just memorize information and regurgitate it for the test. You needed to use critical thinking to apply information learned in this and other classes to specific situations. I tried to help my friends as much as I could and their grades improved. I wouldn't want to go through this process without them! There were other students who came to me for help and I did the best I could, but you can't really teach someone how to do critical thinking. They just need their lightbulb to go off. There are a fair number of people who won't be moving forward to the next class with us. There are a couple of people who are failing for the second time and will be kicked out. Honestly, this is a good thing for a few of them. They would be terrible nurses. Maybe in a year or two, they would be more prepared but right now they are not in the right place. If they weren't failing this class, they would be failing the next one. So yesterday afternoon, some schoolmates and I went out for some much needed margaritas. Last night, David took me to get a massage and then to see the new superman movie, Man of Steel. It felt SO good to be free of pharm!!! But I only have a brief break. Second week of July, I go back and start working with patients. 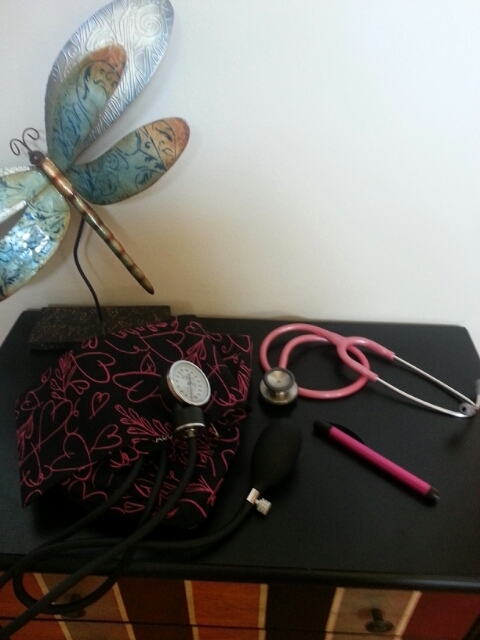 I have ordered my stethoscope, bp cuff and pen light... all pink, of course! They should arrive on Thursday. But, for now, I just want to clean my house! It has definitely suffered during this quarter. David helped a lot but he is in his master's program. Basically, we only kept up with dishes, laundry and the kitchen/dining floors. There are dustbunnies in the corners! How embarassing! I know it will probably be just as bad next quarter. I will have one full day of class (8:30-5), a half day of class (8:30-12) and a 12 hour day of clinicals. Plus my job, of course. So I'll give the house a good scrubbing as it is likely to be the last full cleaning it will get until the end of next quarter! We haven't cancelled our hotel reservations yet and I am still sewing our stuff whenever I have a spare moment. It is slow going, but it is getting done bit by bit. So we haven't given up yet, but next year might be better. I will be getting ready for my final class which is sort of a capstone class (no clinicals). I'll be studying for my license, but nothing pressing to keep me from going that weekend. Of course, David will still be in his Master's program but no clue what class he will be taking at that point. I really want to go to this event!! Except for one medieval event, I haven't done a costumed event in a couple of years! First I had my ankle surgery and then we were moving back to the US. I need a fix!!! I suppose we could still take a trip to Williamsburg some other time, but it just wouldn't be the same. I swear that sometimes my life is like a bad tv show or one of those lame movie of the weeks on lifetime! LOL So I thought I would share my morning yesterday as I prepared to go to school to take two final exams. The last things I do before leaving the house is make coffee and then feed the dogs while it is brewing. So I was getting their food together and putting Allie's different meds and supplements in her food bowl. She takes children's benedryl for her allergies and they are a real bugger to get out of the package. It is one of those where you have to peel back one layer and then punch the pill through the thin foil except that the peel back part never fully exposes the pill so you have to wrestle with it. Anyway, yesterday I was thinking about my final so I was distracted and as I struggled to get the pill out, it fell on the ground and was immediately jumped on by the dogs. Little Gidget was the first one there. :( I called the vet because the pill was 12.5 mg which is the dosage for a 12.5 pound dog and she weighs 2 pounds. They said that is a toxic dose for her and to give her hydrogen peroxide to make her throw up. Gidget is the best dog ever when it comes to pills or meds or anything. She actually DRANK the hydrogen peroxide! I didn't have to force it into her mouth or anything! Crazy dog. Anyway, so much barfing occurred... poor little thing. And no pill. She didn't actually eat it. One of the other dogs did which isn't toxic for them. Whew! In the meantime, Allie pooped in the middle of the kitchen where I was dealing with Gidget. It isn't her fault. She is old and when she has to go, she has to GO. I was ignoring her pleas for obvious reasons so she just went. As I am dealing with a sick Gidget, I see Izzy running to eat the poop (gross I know) so I yelled NO. Allie thought the no was for her and started waddling through the house leaving little nuggets. *sigh* Gidget was feeling better so I started cleaning up after Allie. I got the mess in the kitchen and then started following the trail through to the living room. At the sliding glass door, I thought I saw another nugget so I went to pick it up. Except that it wasn't poop, it was a palmetto bug lying dead on its back. For those of you not from the south, a palmetto bug is a GIANT roach that come in from the outside once in a while. About an inch and a half long. They are really disgusting. I didn't want one of the dogs to try to eat it so I decided to pick it up along with the poop and just flush it all at once. Well the damn thing wasn't dead! So when I went to pick it up it started to run onto my hand... poop went flying, let me tell you! Then it flopped back on the floor on its back looking dead. What is it a freaking possom?! So I tried again thinking that I would sort of smush it into the poop and then it would be stuck there. I had previously tried with a bit of the napkin. Again, it tried to crawl on me and poop went flying. So I stepped on that mother fucker. Silver lining? We had an incident with Gidget a couple of weeks ago where her digestive system got blocked by a huge hair ball. We didn't know if we should start giving her cat hairball meds or if it was a fluke. When she barfed everything up, there was a hairball about half the size as the last one. So she probably would have had problems with it by next week. Vet is going to give us meds for that. And I aced both my finals! Second fitting of the stays went much better. The back is a little wide at the top, but not enough to warrant another muslin. I'm going to take an inch out of each back piece and it will be fine. Sorry the picture isn't clear. I took it with my phone and the lighting wasn't great. The pink is the lining and the blue and ivory floral is the outer fabric. You can't really tell but the flowers have a pink center. May not be period, but it is very cute. And the ivory leather binding looks really good with it. The white is the coutil for the strength layer and then there is the reed for boning. I have a corset/stay making phobia, but I need to get past this so that I can start making pretty dresses and jackets! I have studying to do this weekend, but hopefully I can get some work done on it. We've booked our room for UTR, so we are going, baby! Now the sewing begins. This is going to be a little stressful because it is a new period for me. I've looked at tons of fashion illustrations, but haven't actually sewn anything for the period. I've done a grand total of 3 18th century items, a very early 18th c en ferreau mantua, a chemise a la reine and a dormouse cap. Maybe I can use the cap. ;-) So not only am I sewing in unfamiliar territory, I also have to make stuff for David. Men are just shaped wrong! lol I've never done anything post 14th or 15th century for him. In other words, I've never done anything tailored for him. But we will make it work! I'm trying to conserve money where possible so I'm trying to use my stash where it is appropriate and use the patterns I already have wherever possible. I'm starting on my stays this weekend. I already have the pattern and am going to fit it using the cardboard and duct tape method. I understand victorian corsetry more so than 18th century stays. What sort of boning do I use? One pattern I have says to use featherweight boning... not going to do that. The other says plastic boning. Not going to do that either. I have some spiral steel boning, but would it be better to get plain steel boning? I know about reeds and stuff, but this first time out, I am not terribly concerned with being totally period correct. I need to get my feet wet first and then I will improve my kit later. Also... if I am going to for a late 1770s-early 1780s look, would pocket hoops be appropriate? Or is that too early? Would I use just a hip roll and petticoats instead? If pocket hoops are appropriate, what sort of boning/steel would you recommend? I have some hoop steel that I think I used for my cage crinoline. Too heavy duty or not? Would two layers of plastic boning be strong enough? I hate to use plastic boning though. I am not even sure I have any to be honest. I have a plan (sort of) about what I need to make for the trip. I want to try and mix and match a little to reduce how many pieces are needed. We are going to be there for 3 days (Fri, Sat and part of Sun). So I figure at least 3 outfits for me with the possibility of another nicer dress for a dinner out. David will need 3 outfits, but I am hoping I can mix and match some of the pieces to go with more than one. 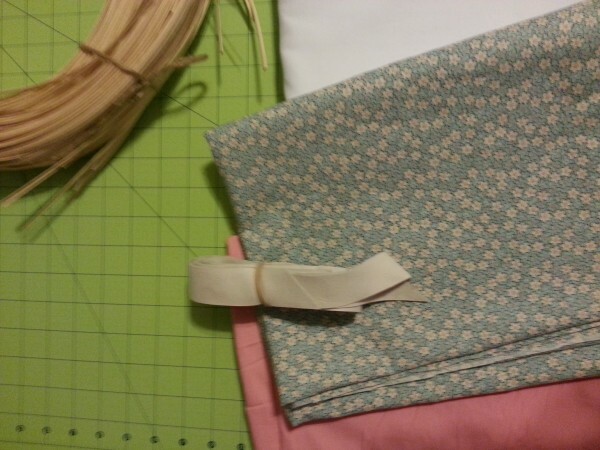 Like I have some pretty light minty green linen that I could use for breeches and waistcoat with a darker linen coat. Then have darker linen breeches and waistcoat to go with the same coat. And then one other coat to go with the dark green. Or maybe if I can't manage a third coat, he could wear the light green waistcoat with the darker green coat and breeches. Something like that. I have some lovely wool, but I know it is going to be hotter than hades and want to try and make him comfortable. Poor soul has had to endure far too many hot days wearing wool when we were dancing with the Regency and Victorian dancers. Isn't that right, Megan? ;-) For me, I am looking at using linen as well as some cotton chintz that I got from B&T a while back. I know this was a big ramble! Please comment if you can help! I have lots to update from the holidays and stuff, but just too braindead at present. I'll update soon. That reminds me that I need to take pictures of sewing exploits too. 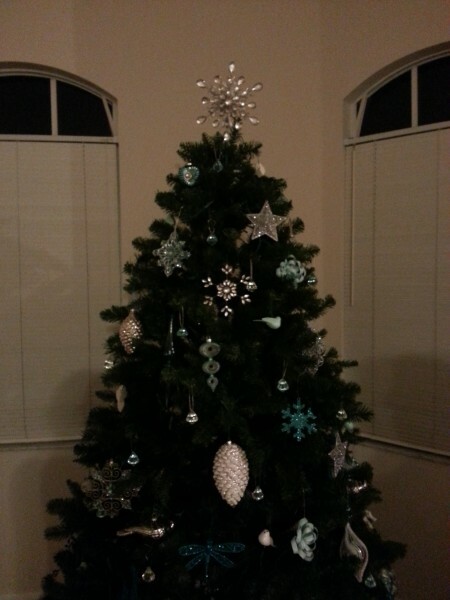 After three years without any Christmas decorations, I am so happy to finally have a tree up!! 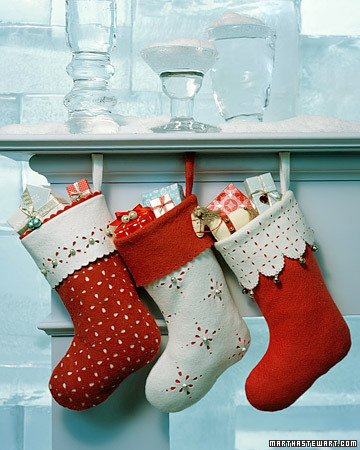 It was fun singing along to Christmas carols and decorating. 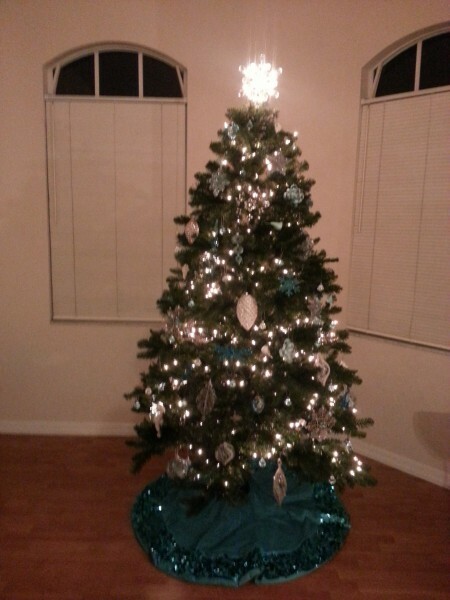 Still have to do the rest of the house, but even just with the tree, the room looks so festive. 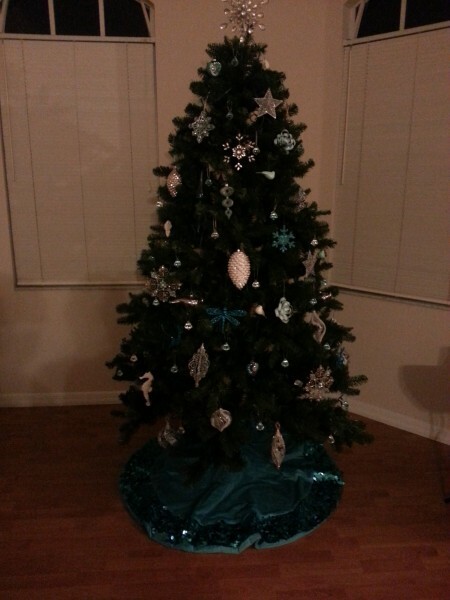 Please ignore the wrinkly tree skirt. Forgot to smooth it back out after decorating. Our colors this year are aqua, silver and white. Hey... it's Florida! How freaking cute are these? So I took a run to Joanns and Michaels yesterday. Our colors are aqua and silver so I bought some dark aqua (peacock?) and white felt. But now I am wondering if I should have gotten the grey felt to go with the white. The blue is more colorful and festive, but maybe the grey with the white would be more elegant? I might go pick up some grey felt tomorrow and then I'll have both to experiment. I also bought the hold punches in the different shapes, some little jingle bells... and an assortment of little sequins and other doodads. I'm a tiny bit worried. Everything Martha does is perfect. I don't want mine to look like the dog chewed them up! I'm planning on practicing making the holes on some scrap fabric first.